Everyone knows that certain things should not be discussed at the dinner table – or at parties. Mostly, anything related to a woman's reproductive system, whether it's menstruation or menopause symptoms, is considered tactless to discuss. And the more specific it gets the more we avoid the topic. Just imagine the reaction at the table if you brought up vaginal dryness symptoms. Gasp! But just because a topic is taboo or not a fit for a night of dinner entertainment, that doesn't mean it's not a reality. In the case of vaginal dryness, a little bit of openness about the condition, its symptoms and its remedy can go a long way toward improving the quality of life for countless women. Chances are very good that if you are struggling with vaginal dryness, women you see every day are also quietly hoping to find relief. It's estimated that over 50% of menopausal women will develop vaginal atrophy. Some estimates are even higher at 75-90%. So, truly, you are not alone. Every other one of your friends of your generation may be suffering from vaginal dryness symptoms. Why? Lower estrogen levels that come with peri-menopause and menopause lead to thinning of the vaginal wall, reduced lubrication, and inflammation. The entire uro-genital pelvic area can be affected. And this symptom is surprisingly common among women over the age of 50. 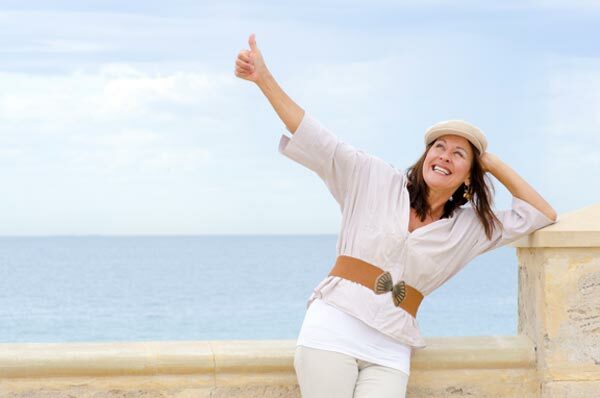 At Replens, we encourage open dialogue about menopause symptoms. Unfortunately, many doctors won't ask specifically about vaginal dryness. Which is why it is so much more important for you to talk about it with your doctor and ask for help and support. Women are highly relational, and most of them are at their best when they are connected with friends and family members on a deep level. Menopausal symptoms like vaginal dryness aren't necessarily something you should share with everyone, but when you are open with a few intimate friends it makes the condition immediately seem more manageable. If you talk to a friend, or have a discussion on a message board or describe your symptoms to a doctor, you are satisfying your need to stay connected and taking the first step toward finding relief. We understand that vaginal dryness and the discomfort it can cause through your daily routine and during intimacy. The menopause resources on the Replens website are there to help those who might be experiencing the problem of vaginal dryness but do not yet know of a solution. Once you talk about your vaginal dryness with friends or family or a trusted doctor, the next step should be to try Replens, the #1 brand of long-lasting vaginal moisturizer that has benefited countless menopausal and post-menopausal women. Lubricants, vaginal moisturizers and estrogen therapy are some of the solutions that can help address vaginal dryness or painful intimacy. Vaginal moisturizers are frequently confused with lubricants. Replens Long-Lasting Vaginal Moisturizer is different than lubricants because it clings to vaginal walls and helps replenish vaginal moisture for days rather than hours. Simply apply Replens a couple times a week to provide immediate alleviation of dryness symptoms. Replens' patented formula attaches to dry, compacted cells and delivers continuous moisture until those cells are naturally regenerated (about every 3 days). This allows vaginal tissues to absorb moisture leaving them hydrated and rejuvenated. Studies published in the New England Journal of Medicine and other publications have reported that Replens is a safe choice that is as effective as hormone therapy in addressing vaginal dryness. Many women who have tried Replens don't hesitate to tell others how it worked for them in hopes that others will also discover this solution to vaginal dryness. Those who share their testimonials are, in their own way, connecting with other women and helping to remove the taboo of vaginal dryness. Don't keep your problem hidden and hope it will get better on its own; take a step to make vaginal dryness a thing of the past. Be sure to talk to your doctor to find the solution to vaginal dryness that works best for you.